Microneedling is a procedure whereby thousands of tiny holes are punctured in the skin. It is ‘controlled skin injury.’ These holes or ‘micro-wounds’ trigger the body to fill in these holes by producing new collagen and elastin in the dermis along with new capillaries. The new blood flow and collagen production results in improvement of scars and rejuvenation of the skin. The texture, firmness and hydration of the skin are improved. Microneedling is also referred to as collagen induction therapy (CIT) which is a very accurate description of what is happening. 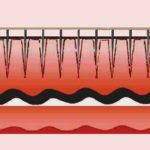 The depth of the needle penetration dictates the level of injury to the skin and the potential results to be achieved. The newer battery powered or electrical devices are able to penetrate more deeply (and vertically) into the dermis giving you a huge boost in collagen and elastin formation. 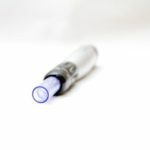 MicroPen , SkinPen , Collagen P.I.N , and Rejuvapen are some of the well known devices used in medi-spas and dermatology/cosmetic surgery practices. 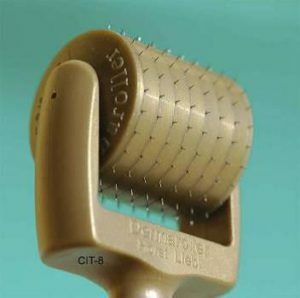 They have between 9 and 12 needles, smooth or beveled tips and the ability to change the needle depth from 0.25-3.0 mm. 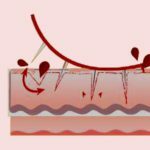 Microneedling can treat many skin conditions and has become a hot topic on sites such as RealSelf. The list of benefits of microneedling keeps growing making this an even more widespread procedure. It is an effective means to treat fine lines, wrinkles, loose skin, acne or other scarring, stretch marks, hair loss, melasma or hyperpigmentation. There is far less downtime with microneedling vs. laser skin resurfacing. 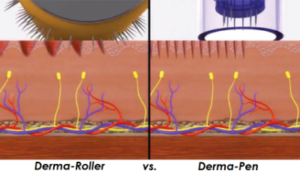 Unlike chemical peels, microneedling can be used on any skin type. 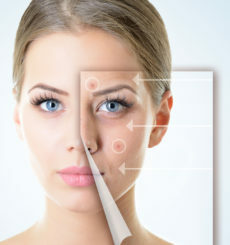 rejuvenation and acne) and peptides (collagen). Rolling methods create unnecessary trauma, are user dependent, risk cross-infection, involve high consumable costs, are too large for small areas and display an undesirable perceived value.